Nuclear deal or not, Iranians wave "Death to America" banners at rally marking 37 years since the Islamic revolution. Iranians on Thursday marked 37 years since the Islamic revolution by waving "Death to America" banners and taking selfies with a ballistic missile, AFP reported. Hundreds of thousands converged on the historic Azadi (Freedom) Square in Tehran, where President Hassan Rouhani was set to make a speech. Many demonstrators carried the traditional placards reading "Death to America" and "Death to Israel" while others carried the Iranian flag, according to AFP. Iran holds annual celebrations commemorating the 1979 revolution, but Thursday’s rally was the first since the nuclear deal with world powers went into effect last month, paving the way for the economic sanctions on Tehran to be lifted. But despite the implementation of the nuclear deal, anti-American sentiment remains prevalent in Iran. Most of this has been fueled by Iranian leaders, who continue to verbally attack the United States. Iran's Supreme Leader, Ayatollah Ali Khamenei, has banned any negotiations between Iran and the United States beyond the nuclear deal, and has declared he agrees with the “Death to America” chants at rallies. At Thursday’s rally, according to AFP, young people reconstructed a scene from mid-January that saw ten American Navy sailors detained by Iranian Revolutionary Guards. State television has repeatedly broadcast pictures of the 10 sailors with their hands on their heads. On Wednesday night, a brief video also showed one soldier in tears. Touted domestically as proof of Iran's ability to defend its borders, the sailors were released within 24 hours, just days before the nuclear deal was finalized on January 16. Khamenei has praised the Revolutionary Guards for detaining the ten sailors and last week gave out medals to the commanders involved. In addition, Iran has been openly flaunting its ballistic missile program, in defiance of UN Security Council resolutions. 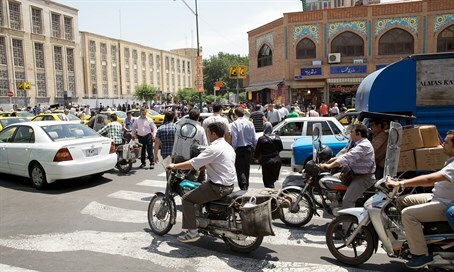 Revolutionary Guards were present on Thursday, displaying a long-range Emad ballistic missile in central Tehran. Many people were taking selfies with the missile, the ISNA news agency reported. In October, Iran tested the new missile, which Tehran says has a range of 1700 kilometers (1050 miles), resulting in the United States imposing new sanctions on the Islamic Republic. Iran has openly ignored these sanctions and, on Tuesday, Iranian Defense Minister Hossein Dehghan declared that Tehran will soon be rolling out an upgrade of the Emad missiles.